Model-based testing (MBT) in its most advanced form allows for automated test case identification, test data calculation, and test procedure generation from reference models describing the expected behaviour of the system under test (SUT). If the underlying algorithms for test case identification operate only on the syntactic representation of test models, however, the resulting test strength depends on the syntactic representation as well. This observation is true, even if syntactically differing models are behaviourally equivalent. In this paper, we present a systematic approach to elaborating test case selection strategies that only depend on the behavioural semantics of test models, but are invariant under syntactic transformations preserving the semantics. The benefits of these strategies are discussed, and practical generation algorithms are presented. 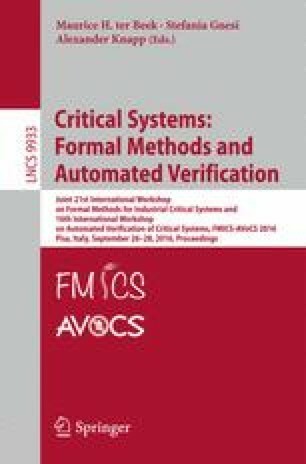 The authors would like to thank the members of the FMICS-AVOCS program committee for the invitation to present this paper. Furthermore, we thank Alexander Pretschner for stimulating discussions concerning the topic of test strategies and their potential dependencies on syntactic model representations. The work presented in this paper has been elaborated within project ITTCPS – Implementable Testing Theory for Cyber-physical Systems (http://www.informatik.uni-bremen.de/agbs/projects/ittcps/index.html) which has been granted by the University of Bremen in the context of the German Universities Excellence Initiative. (http://en.wikipedia.org/wiki/German_Universities_Excellence_Initiative).